Mehul Bhagat believes that every Emory student wants to change the world. The challenge, as he will tell his fellow graduates on May 14 as the 2018 class orator at the Emory College of Arts and Sciences diploma ceremony, is embracing the risks that come with the effort to change with the same optimism that permeates college life. 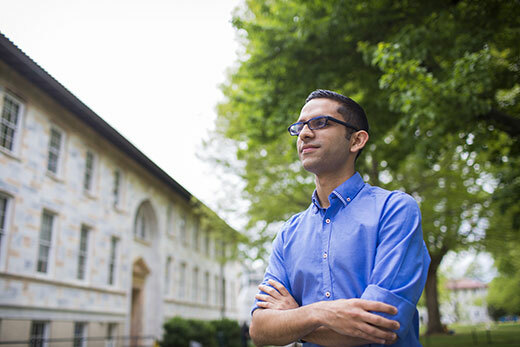 “One of the greatest gifts Emory gave me was the courage to take risks,” says Bhagat, a Woodruff Scholar who plans to go national this summer with his second start-up business, tackling global plastic pollution with a line of biodegradable cutlery. Bhagat’s message of risk and optimism convinced a selection committee of students, faculty and administrators to select him as the sole College speaker following the university-wide Commencement on the Emory Quadrangle. It was a highly selective process. All applicants had to submit a resume and written speech. Five finalists then auditioned by giving their speech and answering interview questions, says Jason Ciejka, assistant dean of the Office for Undergraduate Education. Poetry is actually an early passion for Bhagat, who wanted to be a writer since the second grade. He participated in the Iowa Young Writers’ Studio in high school and dabbled in journalism in another summer program run by the Asian American Journalists Association. It seemed his path was set, and hardly a risk, when Bhagat chose Emory in part because he could take classes with Pulitzer Prize-winning poet Natasha Trethewey, whose work he was reading at his suburban Atlanta high school. His shift to become an economics major began his first year, when his passion for words expanded into understanding how words shape ideas. When he found out about the $1 million Hult Prize Challenge, a humanitarian contest for college students, he saw how ideas could change the world. He assembled Emory’s first Hult team, competing in the regional finals for a project to eliminate malnutrition in South Asian urban slums. It’s fitting, then, that Bhagat met fellow senior Rostam Zafari in a poetry class. In recruiting him for the Hult team, he discovered they both had parents who worked in education, which had instilled in them a commitment to ways to make learning more accessible. Watching fellow Emory undergrads work low-wage jobs, they lit on an idea: Finding a way to connect high school students with college-aged tutors for one-on-on learning sessions. The result was Mystro, an app that linked the pairs based on academic and social interests. They have since sold it to an Atlanta-based nonprofit for an undisclosed sum. At the same time, Bhagat remained focused on work such as his fellowship with the U. S. Department of Labor, where he created the #SouthAsianAnd campaign to boost South Asian voices in media as well as academics. “He’s really someone who wants to make the world a better place, truly, and has charted a path that shows how in the liberal arts, the disciplines enrich one another so you can,” says Emily Leithauser, a visiting assistant professor in English who has taught Bhagat in class and worked with him on his collection of poems. Seeing the contrast between Emory’s commitment to sustainability and waste on campus, Bhagat saw another practical solution in biodegradable spoons, straws and more. The resulting venture, Savor, is again a partnership with Zafari that the two decided to base in Atlanta. No matter how close or far his fellow classmates disperse from campus, Bhagat wants them to feel that same sense of exhilaration that comes with embarking on new possibilities. “At one time, Emory felt like a bigger world to us,” Bhagat says. “Now the bigger world waits, and our ability to change things has never been this large.